What types of businesses and institutions are affected by the ordinance? How do I know if my business is affected? *Note: State agencies such as state government facilities, public schools, and special districts are not covered by the County’s Mandatory Recycling Ordinance. State mandatory recycling and composting laws AB 341 and AB 1826 may apply. See below for more information. What must commercial property owners and managers do to comply? The following requirements apply to all commercial property owners, property managers and institutions such as hospitals and nonprofit organizations located in jurisdictions that have fully opted-in to the Phase 1 and Phase 2 Mandatory Recycling Ordinance requirements. Requirements denoted with an asterisk (*) are not required in each participating jurisdiction. Please visit Rules by City for specific requirements in each jurisdiction. Provide information at least annually to employees, tenants, and contractors describing how to properly use the recycling, garbage, and organics* containers, as well as no later than 14 days after move-in and no less than 14 days prior to move-out for tenant businesses. 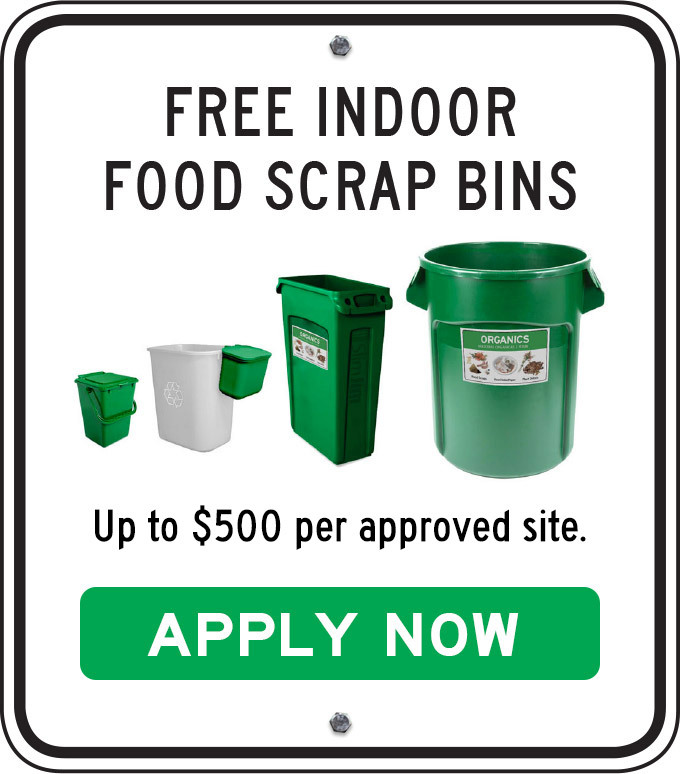 Property owners and managers are recommended to post prominent signs on or near the recycling and garbage containers clearly indicating which are for garbage and which are for recycling. Use posters or decals that contain drawings or pictures of the materials that go into each container. This helps people understand how to sort the materials properly. Many haulers and cities can provide posters and/or decals that are specific to the materials they accept. If a commercial property owner has an agreement with a third party to manage their solid waste collection services, both parties are responsible for compliance. How does the Ordinance define a “business”? “Business” means any commercial or institutional entity, including but not limited to: proprietorship, firm, partnership, association, venture, trust, or corporation that is organized as a for-profit or nonprofit entity. Business includes, but is not limited to, industrial or manufacturing, restaurant, retail, office, hotels, shopping centers, theaters, private schools and some government entities (those not considered state agencies*), but for purposes of this ordinance, does not include multi-family buildings. Are public schools and other state agencies affected by the ordinance? State agencies such as state government facilities, public schools, and special districts have immunity to local ordinances and are therefore not affected by Alameda County’s Mandatory Recycling Ordinance. State mandatory recycling and composting laws AB 341 and AB 1826 may apply. City facilities and private schools are affected by the Ordinance. For more information about the State’s mandatory commercial recycling and composting laws, visit www.CalRecycle.ca.gov/Recycle/Commercial and www.CalRecycle.ca.gov/Recycle/Commercial/Organics. Are not-for-profit and non-profit organizations affected by the ordinance? Not-for-profit and non-profit organizations in the Alameda County jurisdictions listed above are affected. These organizations are included as institutions under the ordinance. Other institutions include, but are not limited to, some government entities (those not considered state agencies), hospitals and religious centers. How are businesses affected by the ordinance? The ordinance requires affected businesses and institutions to have recycling service and organics service sufficient to handle the amount of recyclables and compostables they produce, prohibits the disposal of “Covered Materials,” and prohibits the placement of garbage in the recycling or organics containers. What business types are assumed to generate significant quantities of food scraps and/or compostable paper? In jurisdictions where organics collection is required as part of Phase 2 of the Mandatory Recycling Ordinance, certain business types that generate food waste as part of their operations are required to have organics collection service. These businesses are presumed to generate significant quantities of compostables and include businesses such as restaurants, grocery stores, bakeries, coffee shops, food processors, and senior living facilities or corporate offices with central cafeterias. What business types are likely to generate less than significant quantities of food scraps and/or compostable paper? In jurisdictions where organics collection is required as part of Phase 2 of the Mandatory Recycling Ordinance, certain business types that do not generate food waste as part of their operations may generate an incidental amount of compostables (food scraps and food-soiled paper) and therefore may not be required to obtain organics collection service. Businesses that are likely to generate an incidental amount of compostables include office buildings, retail stores, and small medical offices. However, if a routine inspection of the garbage container reveals that compostables comprise 10 or more gallons (think two 5-gallon buckets full) of a garbage cart or 20 or more gallons (four 5-gallon buckets full) of a garbage bin, the property owner or business will be notified that they are required to obtain organics collection service. 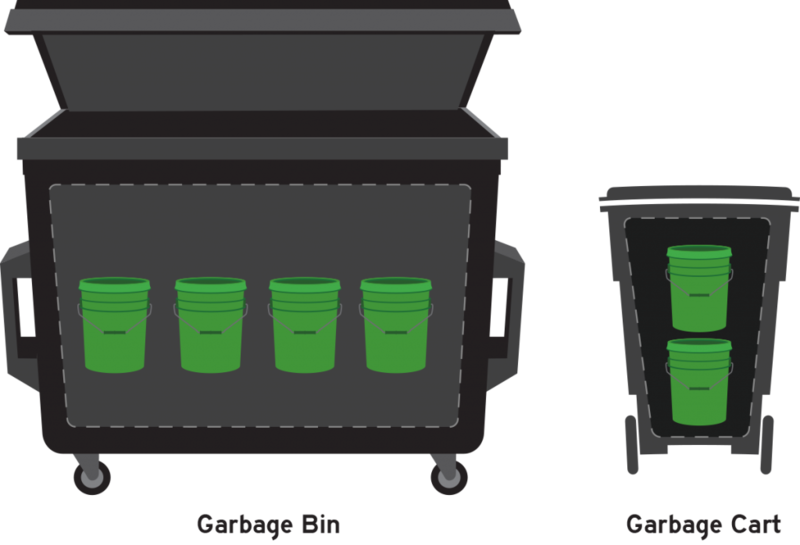 If a business that generates an incidental amount of compostables shares garbage service with a business that generates significant quantities of food scraps and/or compostable paper, the shared account must obtain organics collection service. Is our business required to de-package discarded food? Businesses that regularly generate significant quantities of organics (food scraps, compostable paper and plant debris) must keep those materials separate from garbage and place them in an organics collection container. Quantities of organics are considered “significant” when 10 or more gallons of organics are disposed of in a garbage cart or 20 or more gallons are disposed of in a garbage bin at any given time. This rule applies to both packaged and unpackaged food. If you meet or exceed the significant quantity threshold above, you will need to remove any wrappers or packaging from the food, place the discarded food in an organics collection container and recycle any recyclable packaging. For example, expired bags of chips must be opened and the chips emptied into your organics cart or bin. Other options may be to ask vendors to take back spoiled food or to donate surplus food to your local food bank or other non-profit organizations. If the cost of de-packaging (or the combined cost of de-packaging and increased solid waste collection costs) is equal to or greater than 30% of your typical solid waste bill, you may be eligible for a Financial Hardship Waiver. I am in a jurisdiction that does not require all businesses to recycle and I had 4 cubic yards of weekly garbage service when the ordinance became effective. However, I fell below that threshold when I started recycling service and/or reduced my garbage service level. Am I still subject to the ordinance? Yes, you are still subject to the ordinance. The ordinance covers all commercial accounts subscribing to 4 or more cubic yards of weekly garbage service as of November 1, 2011 or any later date. I am an employee of an affected business. How am I affected? 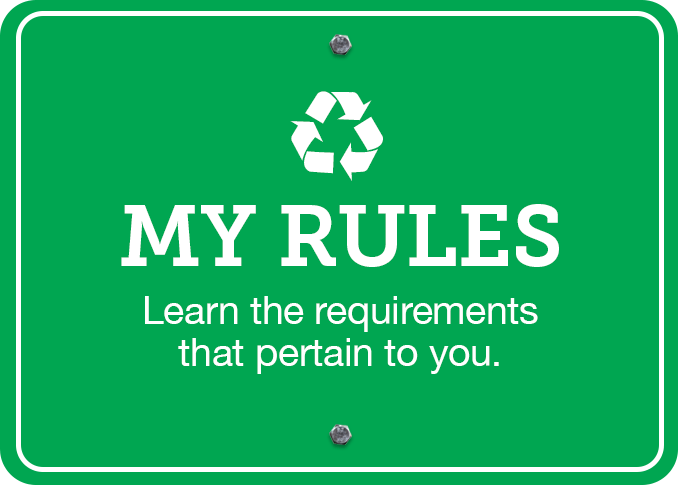 Employees are encouraged to recycle and help their employers comply with the ordinance. Individual employees will not face penalties or fines for non-compliance but businesses and institutions will. What resources and support are available to help businesses and commercial property owners comply? City contracted haulers can provide assistance to businesses and multi-family residential properties that are starting or increasing their recycling and/or organics collection services. Free publications and tools to help commercial customers start or improve their programs are downloadable here. Assistance is also available from the Business Technical Assistance Team. For inquiries click here. What will happen if I don’t follow these requirements? Free assistance will be offered to ensure that the property owner knows what recyclable materials are covered by the law and any other actions they must take in order to comply. If the business or property continues not to comply, even after assistance has been offered, the business or property owner may be fined. Additional information on how the law will be enforced can be found in Section 11 of the ordinance. Is there a fine for failing to comply with this ordinance? The fine for the first violation will not exceed $500. Fines increase for subsequent violations. For more information, see Section 10 of the ordinance. No fines were issued prior to January 1, 2013, in order to allow all businesses and property owners ample time to bring their buildings into compliance. Who is in charge of enforcing this ordinance? Alameda County Waste Management Authority is responsible for enforcing this ordinance and has the active support of all participating cities and the County of Alameda. What is the schedule for enforcement? Enforcement began on January 1, 2013 for all “opt-in” jurisdictions other than Pleasanton. Enforcement for Pleasanton began on September 1, 2013. Enforcement action related to the requirements of Phase 2 of the ordinance (including expanding covered accounts to all businesses and institutions and adding discarded food and compostable paper to the list of covered materials) began on January 1, 2015 in participating jurisdictions. For FAQs that pertain to all sectors, see the General FAQs page.